Thinking about making the switch to Hund or one of the other StatusPage.io competitors? This guide aims to help point out the key differences that Hund has to offer. Hund monitoring integrations communicate directly with third-party providers for near real-time alerts, and are not dependent on other services for receiving monitor updates (e.g. parsing service alert emails). Hund's goal is to build integrations for commonly used DevOps tools (roadmap). Customers have full access to every integration. Integrations are flexible and customizable to your needs. For example, Hund's email notifier integration allows a company to use their own SMTP provider in place of Hund's. 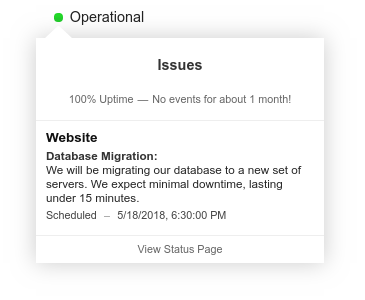 Unlike any other status page provider, Hund provides insight into both past issues as well as uptime changes. 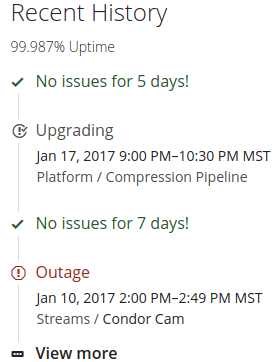 Included in historical timelines are uptime streaks, indicating how long you have held stable uptime since your last service interruption. Visitors can instantly understand service reliability based on your historical timeline. Visitors to your status page often want to view the current status of a specific component that may affect them. Hund status pages offer extensive information regarding individual components including their historical timeline, metrics, uptime percentages, and more. Hund status pages offer localization so that any visitor can view your status page in their native language. If your native language is not currently supported, arrangements can be made to offer it (contact support for more information). Most service providers either require you to pay more for a secure custom domain or ask you to provide a certificate, both cost money and time. Hund automatically provides free SSL/TLS on custom domains. The process of securing a custom domain takes less than 10 minutes. Hund's status widget updates in real-time, so customers receive updates from your status page as they happen. For example, if you have limited availability on your API, a widget on your service's dashboard would immediately inform active users of the problem. Such live updates improve customer experience by informing users of problems before they encounter them. Hund believes that branding is one of the most important things to making a status page work for your company. For this reason, Hund offers a full suite of customization features to every customer. Hund's HTML and CSS editors offer full-screen editing with live previews, preprocessors, on-the-fly viewport modes, error highlighting, and more. Whether you are a startup or a global enterprise, Hund supports adding as many team members as you need. Team members do not have access to billing and can have customized access permissions. The more team members you invite to your status page, the speed at which customers are notified by issues across your platform decreases.